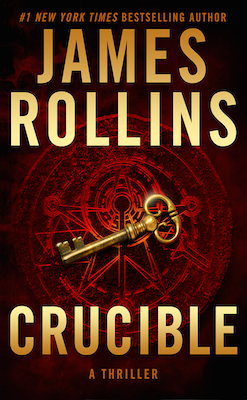 The following is an exclusive excerpt from Crucible, the latest in James Rollins’ Sigma Force novels, which opens on Christmas Eve as Commander Gray returns home to find his house ravaged, his pregnant partner missing, and the only witness in critical condition. Gray chased after him, pausing only long enough to pull a SIG Sauer P365 from an ankle holster. As terror ratcheted through him, he knew he had been right all along. He could never have a normal life. Monk leaped over the steps to the porch. His heart pounded in his throat, making it hard to breathe. Panicked, he burst through the door, armed with nothing but his fists. His half-decade in the Green Berets had trained him to immediately assess a situation. His senses stretched out, taking everything in with one breath. … toppled Christmas tree in the bay window. …shattered glass top of a coffee table. …antique Stickley coat rack cracked in half. …a steel dagger impaled in the banister of the stairs leading up. …area rug bunched up against a wall. Gray rushed in behind him, leading with a black pistol gripped in both hands. Monk’s ears, his skin, his entire being noted the heavy silence. He knew it in his bones. Still, Gray nodded to the stairs. Monk leaped up the steps three at a time, as Gray swept the first floor. The girls should have already been in bed. He pictured six-year-old Penelope, with her strawberry blond hair in pigtails, her Christmas pajamas covered in dancing reindeers. And her auburn-haired sister, Harriet, younger by a year but ever an old soul, always serious, always with a question on her lips about the world. He ran first to the guestroom, where the girls should be dreaming of gaily wrapped presents and candy canes. Instead, he found the beds made, untouched, the room empty. He called their names, checked the closets, swept through the other rooms, and discovered the same. An overwhelming sickness narrowed his vision to a pinpoint as he stumbled down the stairs. “Gray…” It came out as a half-sob. Monk hurried through the ransacked great room, past the dining table, which was bumped askew and in the way. Two chairs lay on their sides. He tried not to picture the fierce fight that must have broken out after the home invasion. He burst into the kitchen, evidence of the battle growing more intense. The refrigerator door stood open. Scattered knives, pans, and broken plates littered the floor and center island. A cupboard door hung by one hinge. At first, he failed to spot Gray, but as he stepped around the island, he found him kneeling on the hardwood floor. A body lay sprawled before him. Monk’s breath heaved in his chest. Monk crashed to the floor. Instinctively, he reached his arms to cradle Kat to his chest. He came close to punching his friend, wanting to hit something, but he knew Gray was right. Kat’s arms were lacerated in multiple places, weeping dark blood. Dark streams flowed from her nostrils and left ear. Her eyes were half-open, but the pupils rolled back. From the corner of his eye, he spotted a stainless-steel kitchen mallet. Blood-matted auburn hair—a match to Kat’s—was stuck to one corner of the heavy utensil. He gently took Kat’s wrist in both hands. The fingers of his prosthesis sought her pulse. The lab-grown skin was far more sensitive than his real flesh. He judged the beat of her heart, picturing each contraction of ventricle and atrium. He shifted his prosthetic hand to her index finger, grasping the tip between two of his own. He mentally activated a small infrared light in one digit and a photodetector in the other. The light radiated through her fingertip and allowed him to get a crude pulse-ox reading, a measurement of the oxygen saturation in her blood. He gently took Kat’s wrist in both hands. The fingers of his prosthesis sought her pulse. The lab-grown skin was far more sensitive than his real flesh. He judged the beat of her heart, picturing each contraction of ventricle and atrium. Not great, but okay for now. If it fell any further, she would need supplemental oxygen. Monk had been a medic with the Berets. Since then, he had enhanced his training further, his specialties in medicine and biotech. He and Gray—along with Kat and Seichan—all worked for Sigma Force, a covert group operating under the auspices of DARPA, the defense department’s research-and-development agency. With the exception of Gray’s girlfriend, they were all former Special Forces soldiers, recruited in secret by Sigma and retrained in various scientific disciplines to act as field agents for DARPA, protecting the U.S. and the globe from all manner of threats. Gray already had his scrambled sat-phone in hand, dialing Sigma command. He shook his head, his face a mask of fury and fear. Meaning she would’ve heard him. “Maybe.” Gray didn’t sound hopeful. Monk understood. Seichan was a former assassin, as capable as Kat, if not more so. But eight-months pregnant and hauling two panicked children, she could not have gotten far if pursued. They had to assume Seichan and the girls were taken. Monk nodded. He took similar precautions at his place, an unfortunate necessity in their line of work. Once connected with Sigma command, Gray tapped the speakerphone so Monk could overhear. In short order, Gray had Painter Crowe, the director of Sigma, on the line. In terse details, Gray filled him in on what had happened. In the distance, sirens echoed through the cold night, growing louder. Monk leaned closer to the phone, wanting—needing answers. As he knelt at Kat’s side, he stared out to the great room, to the toppled Christmas tree. His gaze caught on a sparkle of crystal on the hardwood floor, reflecting the twinkle of the porch lights. It was an angel, broken-winged and shattered. His fingers tightened on Kat’s hand. Painter offered no solace, no reassurance. Instead, the director’s voice rang with worry. From CRUCIBLE. Used with the permission of the publisher, William Morrow & Company. Copyright © 2019 by James Rollins.